‘The best airline I have ever flown with’ were the exact words many spoke to me when i told them of my plans to take to the skies with Qatar who hold, for the 3rd year, the Skytrax award for world’s best airline carrier. Qatar is the National Carrier of the state of Qatar flying passengers in their seamless 5 star service to over 150 destinations world wide. Qatar are one of the fastest expanding airlines in terms of fleet and destinations and they also have one of the youngest fleets in the world – launching in just 1997. Their latest addition to their resume is the northern-most Emirate of the UAE – Ras Al Khaimah. No doubt, like me previous to this trip, you haven’t heard of Ras Al Khaimah? In recent years, RAK has willingly stood beneath the shadows of Dubai and Abu Dhabis halo, but with the now help and temptation of Qatar to deliver you to right to their doorstep- RAK’s future is looking increasingly brighter. Ras Al Khaimah offers a more relaxed alternative to the often more crowded destinations in the Middle East. With it’s year round sunshine, mountains, desert and idyllic beach front hotels RAK is perfect for the adventurous type or for those wishing to indulge in 5 star luxury. With Qatar offering flights starting from £300 a luxury long weekend break just became both easier and more affordable. The journey from the UK to RAK first takes you first to Hamad international Airport, Qatars state of the art hub, before connecting through to RAK. Flights in the UK depart from London, Edinburgh Manchester and after the recent announcement of Birmingham, total 71 flights a week (as of April 2016). As part of the inaugural flight from Doha (Qatars hub) to Ras Al Khaimah on 2nd Feb 2016, I was invited along to not only experience the airline but too, their award-winning Business class service before going on then to discover the adventure on offer in Ras Al Khaimah. After the positive reception everyone was giving Qatar when I spoke of the airline – I was more excited about the plane journey than the destination! Flying from London to Doha meant taking to the clouds on an A380, the biggest aircraft in the Qatar fleet, one nothing short of outstanding. Let’s face it, the majority of us will probably be booking into Economy Class should we be choosing to fly with Qatar, but even so… Qatar Economy has a lot to stand proud of. As one of the youngest fleets in the world, Qatar economy is freshly designed with more space than ever before. The gorgeous coordinated linen and seat clothes are visually refreshing and smart, making an incredibly positive first impression. The cabin crew, voted ‘Best in the Middle East’ for 7 years in a row, are on hand to assist in making your flight as comfy as possible with fresh pillows, blankets, toiletry pouches and my personal favourite – hot towels on demand, the perfect way to freshen up during your flight. With adjustable head rests, quality inflight meals and beverages (inclusive) and the brand new Oryx personal entertainment system boasting over 2,000 tv shows, films and albums, Qatar oozes quality from every aspect. I’ve personally never been able to financially justify any class but Economy, but seriously, after my recent encounter, Qatar have shown me EXACTLY what I’m missing out on in Business. From the moment I stepped into the airport, the immaculately dressed and flawless attitude of Qatar’s staff guided us through every single step from check in and arrival in the lounges, to our gate, ensuring our journey to the aircraft was as smooth and enjoyable as possible. The biggest compliment I can pay to Qatar is their incredible attention to detail. The things that make ALL the difference and most certainly deserve them of their 5 star rating. Moments after embarking the Aircraft a dedicated member of staff greeted me by my full name and assisted me to my seat before introducing herself, taking my coat to hang for the flight duration and offering me a glass of the finest bubbles or whatever was to tickle my taste buds. Whilst the champagne cork popped in the distance, I investigated the spacious and wholly convenient components that made up my pod. Already waiting for me was a Giorgio Armani Wash Bag containing the most gorgeous perfume & body cream, alongside an eye mask, flight socks, lip balm and ear plugs which, in itself was a treat. As my bubbles arrived at my fully adjustable-to-what-ever-position-i-could-dream-of seat, I was assured with a warm smile that whatever I should need will be attended to at the press of a button. In-between browsing both the brand new Oryx Inflight entertainment system which has increased the number of movies and online tv shows from 950 to 2,000, and sipping my bubbles, I browsed the Business class food and beverage menu. Qatar’s attention to detail totally peaked with their inflight dining experience. Their extensive 7 course menu and on demand service means you can order whatever you like – whenever you like, making your meal completely customisable and tailored to your individual preference. The space provided was really a DREAM, particularly when it came to eating. None of the frantically packing up your laptop and chucking everything on the floor when your meal comes business. The gorgeous staff glide along, lay your table cloth and set your fold out table 5 minutes before your meal is ready, allowing you to adjust your belongings in plenty of time. The space allowed me to have my bag next to me within easy reach, my laptop to the side, my meal in front of me and Spectre on the TV in front of me – perfect for the business traveller. The food resembled that of a top class restaurant, the choice was satisfying even for the fussiest of eaters and courses were prepared fresh to your request. The inflight menu definitely gets my seal of approval. If that wasn’t enough, should you be lucky to fly Business / First on the A380 as I did, they have a dedicated bar area with inclusive tipples, cocktails, wines, champagnes, bar snacks, cookies and fruit, alongside a leather seating area in which you can relax, stretch your legs and socialise with other passengers. Mojitos all around! The PERFECT way to start your holiday. The benefits of Business class with an even more luxurious space / pod, making the flight absolutely World Class. Just like Business, you can recline, adjust and move pretty much every aspect of your seat to cater to your preference and should you wish to crash out, you can convert your seat into a fully horizontal bed, pop on the provided designer sleepwear and sleep the whole way. (I refused to sleep and miss a single part of the incredible experience, but a luxury perk for the frequent flyer). Qatar airways is simply more than a service – it’s an experience. 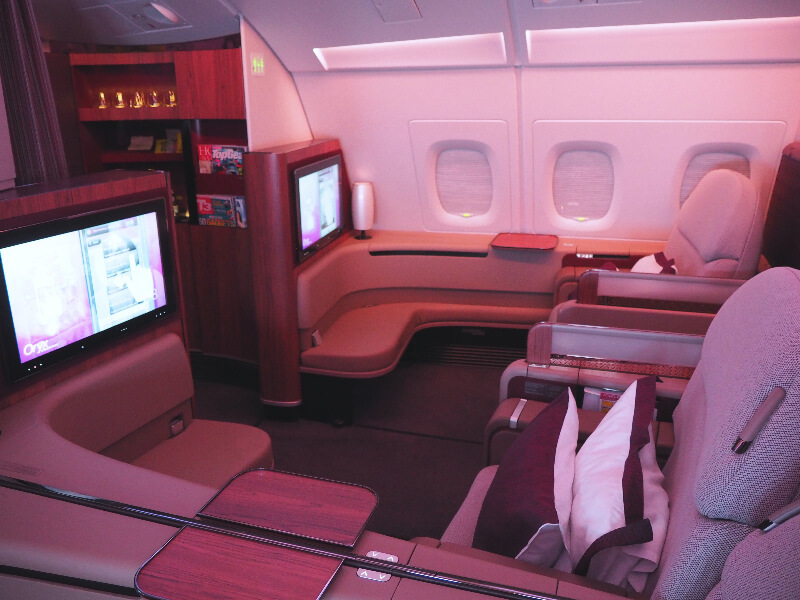 Until boarding Qatar Airways, I’d never wished more for a flight to last longer. Truly the biggest compliment i could give. STAY TUNED FOR MY ADVENTURES IN RAS AL KHAIMAH! Have you guys ever flown with Qatar?